What if someone offer you a job when I didn’t need a job, would you take the job? What if someone offer you a new life, when you were good just where you were at, would you receive that new life? I honestly wouldn’t. I’m great where I am. Life is good. Income in great. My job loves me and I love my job. But what if Jesus walks up to you and tells you, “Follow Me”. Would you follow him? A homeless guy that was healing people and raising the dead. You have no idea where he might take you. All you know is he told you to follow him. So do you follow him? What if you follow Jesus? In Matthew 8:18-22, we see 2 people who wanted to follow Jesus. Jesus had something different to tell both of them. As Jesus and his Disciples were leaving to get alone time on the other side of the lake awake from the crowd. The Teacher of the Law who just witness the great Sermon on the Mount and then Jesus healing people. You could just image the fame that Jesus is receiving. You got crowds following Jesus. Fame and wealth are surly in this men’s path way, right? So you get this teacher of the law to come and try to join in on that fame and future and prosperous life with Jesus. “Teacher, I will follow you wherever you go”. This teacher of the law thought Jesus must have had a home or place he lived with prosperity, but Jesus made it clear that he was a homeless men. “Foxes have holes and birds of the air have nests, but the son of Man has no place to lay his head.” Jesus draws a clear picture that following him, means you give up your life. Give up everything for him. I don’t think the teacher of the law wanted to give up anything, but as only wanting to gain something by following Jesus. We see another men say that he wants to bury his father before he follows Jesus. Jesus says, “Follow me, let the dead bury their own dead.” Verse 22. Jesus is seeking people who are willing to love him more than themselves and their own family and mom and dad. In the Jewish life. It’s honorable for the sons to bury the father. For Jesus to make a statement life this is him saying, “Hey you either all in or not in”. It’s not, “Oh let me do my thing, and then when things are right, then I’ll come and follow you”. Nope Jesus wants to know, you all 100% in this with him. There is no terms and conditions love contracts. It’s your in or out. The teacher of the Law was all in, but for the wrong reasons. The other disciple was kind of in, but for right reason. Jesus is asking us to go 100% in, but for the right reason. The mean thing we need to do today is choose this day. We will follow Jesus or our own way. A lot of people want to wait for the right time to come, until they actually get up and follow Jesus, but Jesus says, the right time is NOW! What will you choose? Now or Never? I say never because a lot of people say, “Later, Later, later” then they die and “Later” became “Never”. 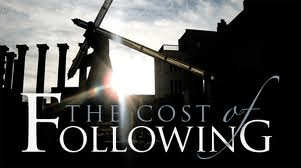 Following Jesus will cost everything. It’s so worth it. Submit fully to Jesus today, and leave the crowd and go with Jesus in the tiny boat. Not 99.99999%, but 100%. This entry was posted in Study of Matthew and tagged Cost Everything (Study of Matthew – Part 32) by Keith West. Bookmark the permalink.